As a father, clinician, and President of the Children’s Spine Foundation, I know this sentiment is never more true than when we help children and families dealing with complex spine deformity. We understand that our research and educational accomplishments impact not only those we are treating today, but all children with spine problems. 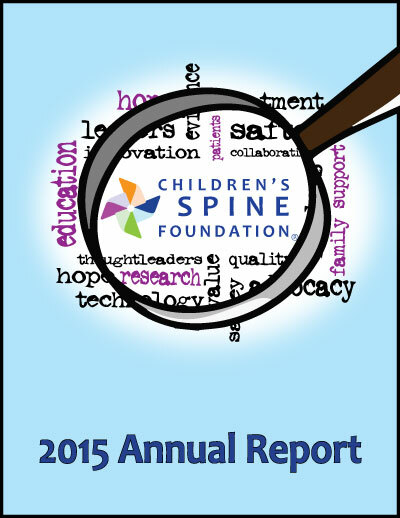 In 2015, the Children’s Spine Foundation published articles on the treatment of early onset scoliosis, presented at major conferences, educated our peers, and helped families obtain quality medical care. Because of the tremendous support of our donors and partners, we improved the lives of over 3,000 children living with complex scoliosis and paved a better path for those yet to come. Please join us as we look closely at our current successes and plan for a future when all children with spine deformity are not limited by their condition; but flourish through childhood into mature, happy, and healthy adults. In 2015, the Children’s Spine Foundation spent $374K to support medical access, research, and education in the area of early onset scoliosis (EOS).